Tottenham are in search of a new midfielder and once again, they are linked with Sevilla star Steven N’Zonzi, who won the World Cup with France on Sunday. 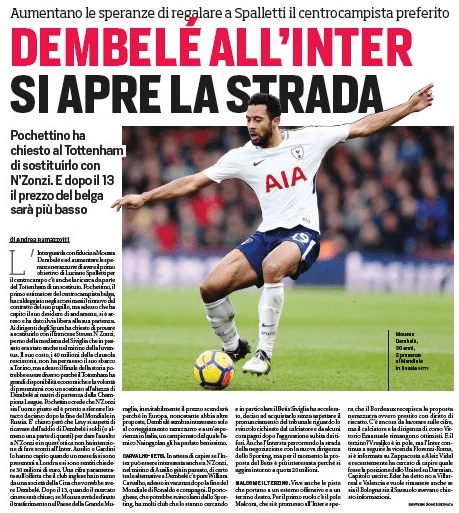 Earlier this month, Italian outlet Corriere dello Sport reported that Argentine boss Pochettino has asked the north London club to hire the services of the Les Bleus midfielder, who has got a release clause of 40 million euros (£35.6m). More recently, Estadio Deportivo have reported that Spurs and Barca are still in the race to sign him and Sevilla will only sell if the above mentioned clause is met. N’Zonzi is naturally a strong holding midfielder and Spurs have already got defensive midfielders like Wanyama and Dier in the team. However, the 29-year-old star can also play in an advanced midfield role if needed and he has the traits to replace Dembele at White Hart Lane. The La Liga star has already got the experience of playing in the Premier League with Blackburn Rovers and Stoke City. He knows all about the game in England having played more than 200 games in the country. Over the years, he has improved a lot and could prove to be a decent signing for Pochettino. Daniel Levy is a very tough negotiator and in the past few years, he has mainly spent the cash on young players, who can serve the club for the long term. Signing a quality and experienced midfielder like N’Zonzi makes sense but it will be very shocking if Levy splashes a fee of 40 million euros to sign someone, who will turn 30 in December.